In order the make the case against weapons research we need to know what weapons research is, and the aim of this chapter is to explain what it is. There is no need to come up with an absolutely precise definition which includes every instance of weapons research and excludes everything else, a kind of ‘demarcation criterion’. We do, however, have a choice as to how we understand “research”, and this will become clear after I have introduced two examples. One of these, the Manhattan Project, is familiar to many, at least in outline, and has been the subject of much writing and discussion. The other, the development of the torsion catapult in the fourth century BCE, is much less familiar. I have chosen these examples for several reasons. 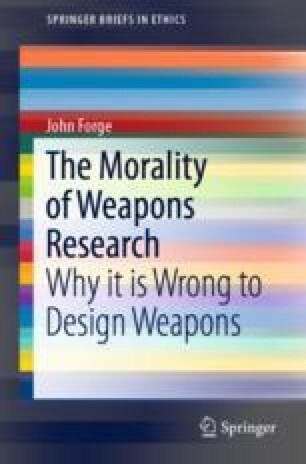 The first is that I want to suggest that weapons research is not a new or recent phenomenon, but has a very long pedigree—this suggestion is a consequence of how I think we should understand research. The Manhattan Project was the beginning of the nuclear age which led to the nuclear-armed world we live in today, with enough nuclear weapons to extinguish much of sentient life on the planet. No more need be said about its relevance to the present discussion. I have defined weapons research as research that is concerned with designing weapons and with the means for using them. It might be asked if this description neglects military technology: does not weapons research aim to produce new military technologies? I have no objection whatsoever to this way of describing weapons research; I could have defined weapons research with reference to military technology, but I think this is an oblique way of doing so. It would be necessary to say what technology is and it is simpler, I believe, to refer directly to weapons. Nevertheless, I will do so here, to show that these two ways to thinking about weapons research are essentially equivalent. The received view of technology is that it is knowledge of technique, where a technique is a way of doing something. Military technology is thus knowledge of techniques that harm living creatures and destroy things that they value. Catapult technology is therefore knowledge of techniques for casting stones and arrows, in order to reduce fortifications and kill their defenders at long range, etc. Military technologies and the weapons themselves are not the same things: the latter are substantive, they are material things, made of wood and rope for instance, whereas the former are propositions, items of knowledge. Technology understood in this way—and there are alternatives as we will see in a moment—resembles design in that both are kinds of knowledge, but again the output of weapons research, namely designs, is different from the corresponding military technology. A design for a weapon is typically a set of instructions for making a weapon, the weapon can then be said to ‘constitute’ the technique, it is what makes the technique practical. Philip and Alexander knew how to besiege fortified places because they had catapults and catapults shoot stones and arrows. This is not, however, to say that thinking about technique has no role to play in weapons research itself, far from it. Suppose a weapons researcher in Central Asia at the beginning of the second millennium BCE was thinking of a way to use horses to provide a fast-moving weapons platform—this a made-up story—one that could outrun an infantryman. Our ancient weapons researcher is contemplating a particular technique. On the basis of his experience of war carts, he comes up with the idea of a chariot. The weapons researcher conjures up the technique, he imagines it, and then invents a weapons that makes it possible in practice. I am not claiming that this is always how weapons research is conducted, but no doubt it sometimes is. But, again, the technique is different from both the weapon that enables it, and the design for the weapon. To define weapons research as an activity that aims to produce new or improved military technologies would focus attention on particular techniques, on casting stones and arrows, on horse-drawn weapons platforms, on massive nuclear explosions, and so on. These ways of harming are executed by means of weapons, and as we have just seen, weapons are the means by which the techniques are put into practice. To define weapons research as aiming at military technologies is thus not to say that it does not aim at weapons design, because to have a military technology in place it is necessary the have the corresponding weapon. This is why I said that this way of looking at weapons research was essentially the same as the one I have chosen. But this would not necessarily be true if some other view of technology were adopted, and one reason why I did not define weapons research with reference to military technology was that I did not want to engage with the various accounts of technology available, except in this appendix, where I will devote one paragraph to talking about one of the more interesting of these, due to Don Ihde. Ihde’s definition of technology in his Philosophy of Technology has three necessary conditions (Ihde 1993: 47). Firstly, a technology must have a concrete or material component, and this condition immediately distinguishes his idea from what I have called the received view. In regard to military technologies, one assumes that weapons themselves are the prime candidates for the material part. In addition, there is a set of praxes or uses that people make of the component and a third condition which I will leave aside. So in addition to the weapon in question, a military technology will comprise (all) the uses of the weapon. Thus if a type of catapult is versatile and can be used as siege artillery, field artillery as well as be mounted on ships, then all of these uses, and any others that might occur, would comprise the technology, along with the catapult type itself. What Ihde’s definition omits, it seems, is reference to technique. Using the catapult example again, what catapults do from this perspective is cast stones and arrows. It is true, of course, that when a catapult is used as siege, or field or naval artillery, it is used to cast stones or arrows. But the uses are particular applications of the technique, of what the weapon does, and Ihde is explicit about technologies having a set of praxes, not just something they do because of the what they are. But I will leave the matter here. Enough has been said to indicate how the idea, or ideas, of military technology fit with the present approach, which describes weapons research as aiming to design new weapons, and about why this approach is the more straightforward.